The project charter is one of the first documents produced within a project, and is used to outline our preliminary understanding of roles and responsibilities, the objectives of the project, the key stakeholders within the project, and gives the project manager the authority to do their job. It can be thought of as the real start of your project, where you lay the foundations for a successful project. Note that in many organizations, a project charter will go by another name such as project initiation document (PID) or project mandate. Why are we doing the project? The charter must outline the business need for the project, typically expressed as a business case. What product will be the output of the project? Basically, what are the deliverables and what features and functions will they have? The project charter needs to be signed off by the project sponsor, thus giving formal authorization for the project to start and for the project manager to do their job. A list of key stakeholders. Any project constraints on scope, time, budget, or quality. Key metrics against which the project will be measured. Any risks which are known at the start of the project. It shows management support for both the project and the project manager. 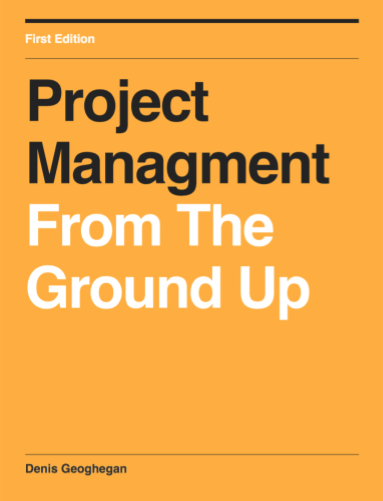 Project managers typically work with no formal authority over the resources and people they need to get things done, so having this formal support makes it much easier to get the people you need to help you. It lays out the high-level requirements and goals for the project. This target setting works in two ways. Firstly, it gives the project team very clear targets that they need to achieve. Secondly, it sets the expectations of management as to what the project is aiming to achieve. It outlines the scope of the project. Without this, the scope of projects has a tendency to slowly expand as more and more stakeholders load their requirements into the mix. This happens so frequently it even has a name – scope creep! It includes a business case. This business case helps ensure that the project is viable, ensures that the project is aligned with the strategy of the organization, and shows how the project contributes to the organization moving towards its strategic goals. In order to pull everything together and make sure all the concepts we’ve covered so far are clear, let’s take a look at an example project charter, and fill it in for an example project. First, take a look at the project charter template below, remembering that you will need to tailor the contents of the project charter to suit your individual needs. Let’s walk through what each of the values in the project charter means and then show a completed example to bring it all together. Project Name: Use this space to give the project a name. Without a name, it will be very difficult to discuss the project with others. Project Sponsor: The project sponsor is the person from the business with the appropriate authority who is authorizing the project to commence. Project Manager: State the name of the project manager. It is important to identify the project manager so as they are involved in the early shaping of the project, ensuring realistic goals and expectations are set from the outset. Date of Project Approval: When the project charter is approved by the project sponsor we enter the date here. Last Revision Date: The date at which the document was last updated. Project Description: This section provides you with the opportunity to briefly describe the project. Scope: State what is within the scope of the project as well as what is outside of the scope of the project. This area allows you to describe briefly the deliverables as well as the work that needs to be done to deliver them. Business Case: Use this space to summarize your business case or link to a document containing the business case. Constraints: If we have any known scope constraints, deadlines, budgetary constraints, or quality constraints we enter them here. You can move the order of constraints around to show their relative importance, so for example, if our primary constraint was Budget and our secondary constraint Scope, we would effectively be saying that if push came to shove we’d prefer the project scope to shrink rather than to go over budget. 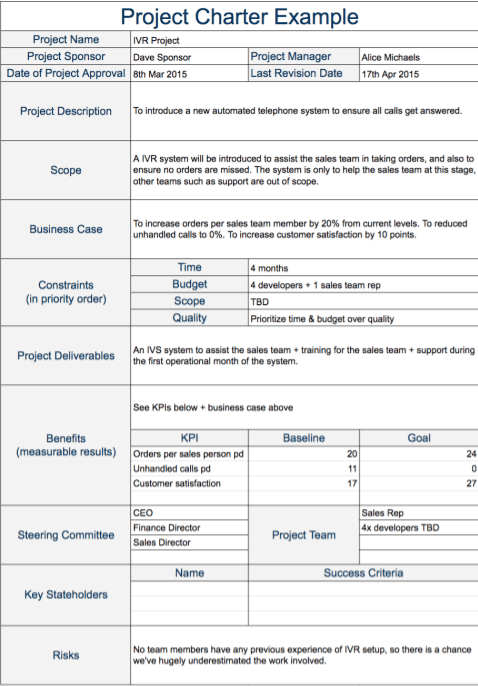 Project Deliverables: Use this space to enter the tangible deliverables that will be produced by the project and given to the customer (project sponsor). Some projects may have lots of deliverables, others just a single deliverable. Benefits: In this space, you can highlight the business benefits expected as a result of the project. There is also space for you to record the key performance indicators (KPIs) against which the project will be measured, understand where you are now for each KPI, as well as set targets for the KPIs. Steering Committee: If you know the people who will make up your steering committee then enter their names here. Project Team: If you know the members of your project team then enter their names here. Key Stakeholders: This section allows you to identify your key stakeholders in the project, and outline what conditions have to be met in order for those stakeholders to be satisfied with the outcome of the project. Risks: If you are aware of any risks that might affect the success of the project then enter them here. Effectively, this section allows the project sponsor and steering committee to enter into the project with their eyes wide open as to the potential risks ahead. The project charter isn’t something you sit down and write in a single day. Instead, it is something you shape over a period of days or weeks as you work with your project sponsor, steering committee, and other key stakeholders to figure out the objectives of the project. Let’s examine an example project charter to bring all of this to life. Imagine we have a company that is growing fast and struggling to deal with inbound telephone inquiries. This means calls are often going unanswered, resulting in potential customers who are unable to place orders, and customers are getting frustrated at sometimes having to call two or even three times before speaking to a sales representative. Constraints: As you can see the order of the constraints has been shuffled in the example to be different to the template. This reflects the fact that in this project it is more important to deliver on-time and within budget than it is to hit a definite scope or quality level at this stage. Benefits: Clear KPIs have been provided giving the project solid, measurable, performance targets to achieve. Risks: Two known risks exist at this stage. Firstly, that nobody on the project team has any experience of automated telephone systems (IVR systems). Secondly, that no end customers are represented in the makeup of the project team, meaning that there is a risk their interests are not heard during project execution. This could result in unhappy customers when they first get to use the product. While you write down these risks here, they will be handled by your risk management process. In summary, a project charter is a key document used in the early stages of a project to clarify our understanding of the project, as well as officially give the project manager authority to do their job. 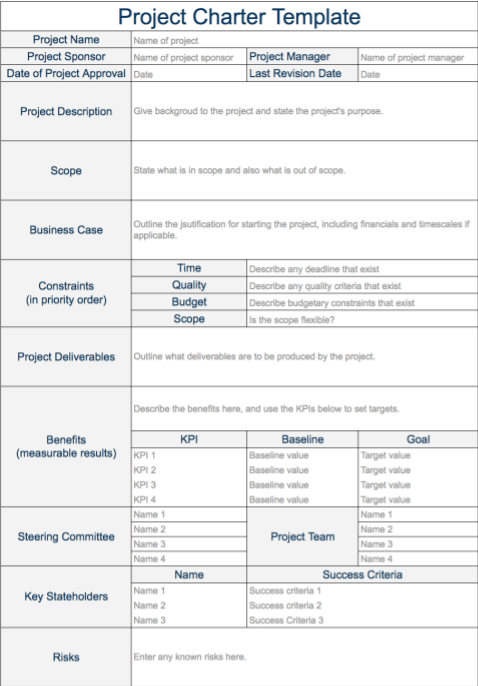 A project charter template has been provided, but feel free to chop and change this to suit the needs of your particular project and organization.